Read D & L COMPANY Archives of Older Product Reviews by TDmonthly. Watch D & L COMPANY Archives of Older Product Videos by TDmonthly. D&L Company is the original creator of the Stomp Rocket, we are proud to have started the stompin’ revolution. We stand behind our name, quality, and customer service 100%. Stomp Rockets are the ones asked for by name. Our Stomp Rockets now feature the “no kink hose”, so there is no air restriction, and the Ultra Stomp Rockets features the OG-1 nosecone, the safest nose cone in the industry. For ages 8+, also available the Jr. 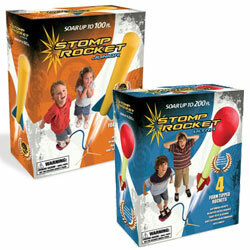 Stomp Rockets for ages 3+. All of our products are of excellent quality, and have won numerous awards, including Top Toy of the Year, and Teacher’s Choice to name a couple. Stomp Rockets are used in schools to teach motion, distance, trajectory etc. Other great sellers include our Rocket Balloon with dual action pump. Our special packaging allows for easy wrapping, and a nice neat appearance. 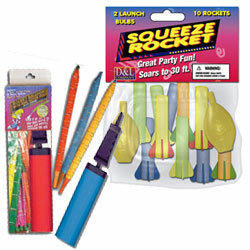 The Squeeze Rockets are great for Easter Baskets, birthday parties, stocking stuffers, stress relievers, or just everyday fun! Minimum orders are one case of anything. If you order 12+ cases of any combination of product, you receive free shipping. Mention ToyDirectory for a special one time discount.